I got out the watercolors to play with this time. They really can be extremely fun to work with. They are my traditional kit to carry backpacking because they are a little bit lighter. Seems these days I keep trying to fill my days with the hiking while backpacking, but I had a few moments at the end of the first day of the last trip. 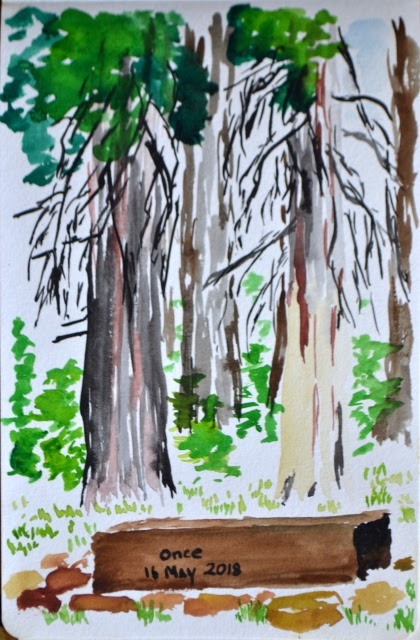 Singed, but still growing, cedars at Madulce Station. Down into the Thousand Oaks area for one last set of trails that are part of the COSCA Open Space Challenge with whoever is in the group. Trouble is, with Geowoodstock on and it being Memorial Day weekend, it looks like all the social geocachers have wandered off somewhere (or caught a cold) and the "group" is me. Well, that is just sad for me. The required trails to be hit today are the Woodridge Loop and Rocky Incline (marked as Hidden Canyon on some maps). The first wraps around a gated community in the hills near it, the second touches into the loop I did while popping up to the top of Simi Peak. 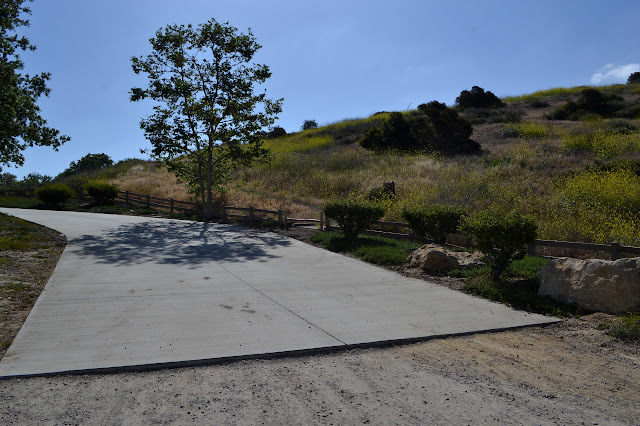 The loop has a small parking lot area that is mostly gravel, but paved on one end. The end heading south is obvious next to the paved portion of the lot and the end heading north has a gravel path leading to a spot across the street from it, so is not too hard to find. My plan was to start south, so south I go. 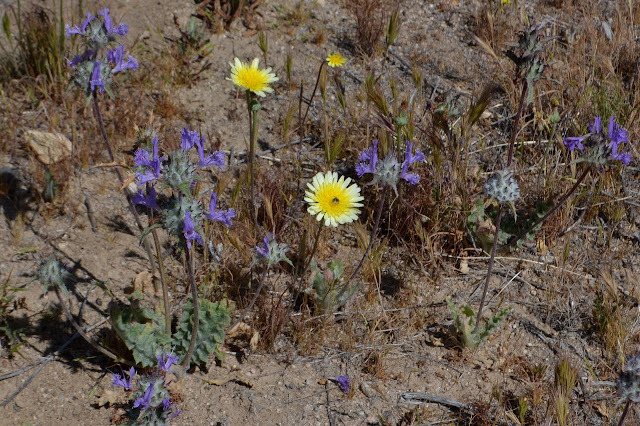 A bit of dried grass and blooming mustard lie beyond the landscaped edges of this lot and road. The trailhead is at the break in the fence and signed with the open space rules. 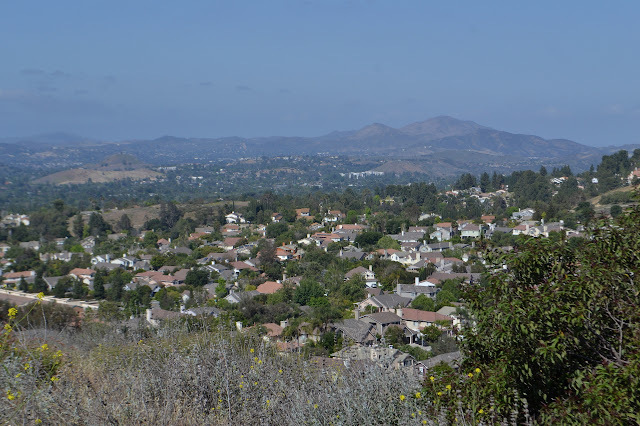 The houses are down in the valley, the trails are up in the hills, so I start off climbing a short way. This does have the effect of bringing more houses into view. They are all over the place but most the hill tops have been left open. Up to the top for a view of Simi Peak with only a few houses far below. Finally, a night that was as promised by the weather predictions: not cold enough to freeze, not even in exposed places. There was still a bit of wet wrung from the air overnight. Clouds rush in once again as the sky brightens, but they are weaker today. There are open spaces behind them. The cows did not come around in the night, so the closest large animal is still the probable bear that thrashed past the edge of camp at Madulce Station. By the time the sky is getting a bit of color, there have been a few clouds flowing overhead. Since it is only 6 or 7 miles out, I am in no hurry to get started, but since the morning is an easier temperature to live in, getting breakfast and packing up flows along quickly. 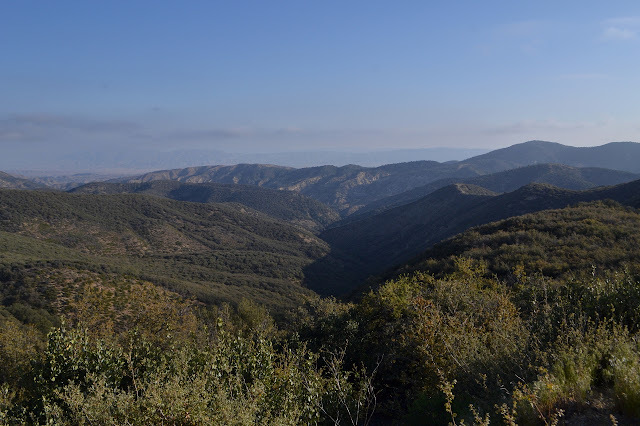 With everything tucked away again, I head back up to Sierra Madre Road and then turn down it toward the car. Many of the cows are hanging out at the junction, but they take off along a path over the hill when they see me. As I gain the road, it is windier and feels a bit colder. That is probably just due to the wind. I had not thought the spot I had was sheltered as it is a very wide bowl, but now I suspect it was. I had nothing but gentle winds all night although there had been harder winds up here as I walked in. A bit of the upper level of the bowl below the road and under ever changing clouds. Looking north. The canyon looks a bit like what the Lockwood Road travels through. All down to similar rocks. Clouds rush in at the first light of the day again, but this time it is happening down below me in the valley and not threatening to encase me as well. The picnic tables got soggy in the night and I avoid so I do not want to touch them or sit on the benches at all. It feels a little too chilly for getting wet. After breakfast, I put out one finger to find that the water is quite hard. All the dribbles and blobs of clear water is an illusion, it is all frozen. There are no air bubbles within to give it away. When the sun finally hits it after hiding behind the mountain for an hour, it simply transforms from matte to glossy. I am on my way out, so do not get to see the change finish. There are miles to walk and one more peak to bag. The morning view from the toilet, which is probably quite the selling point for Alamar Camp for some. The clouds are rolling in from the left. 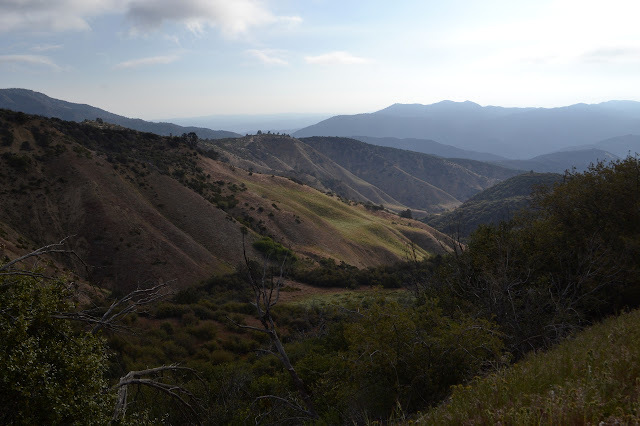 I head back toward Madulce Peak. 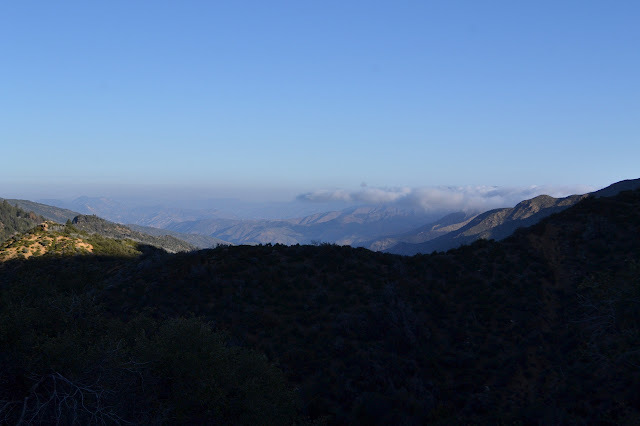 Everywhere, there are hints of thick clouds leaking into places from off the Cuyama River. 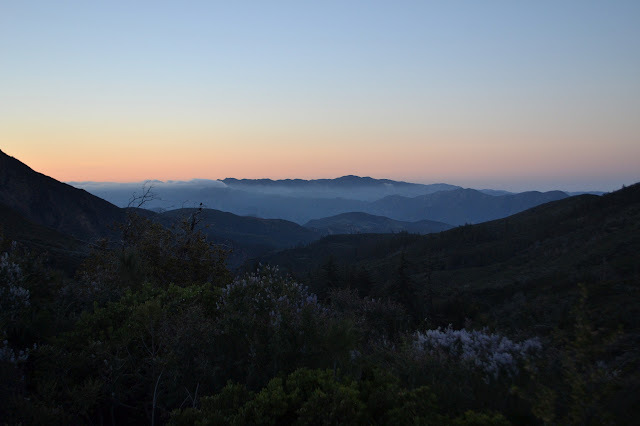 The view from the Sisquoc Trailhead. 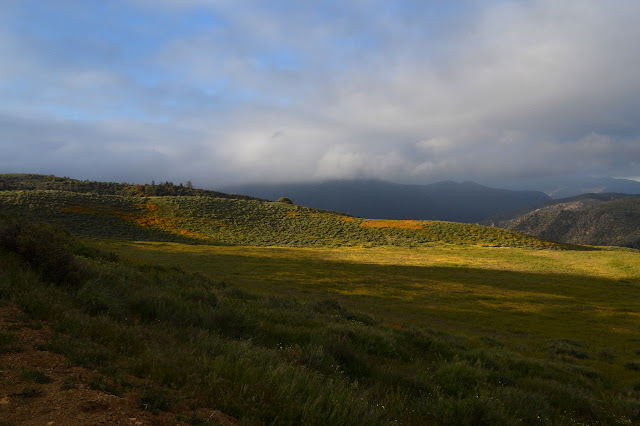 The Cuyama River is trying to provide the Sisquoc with clouds, too. 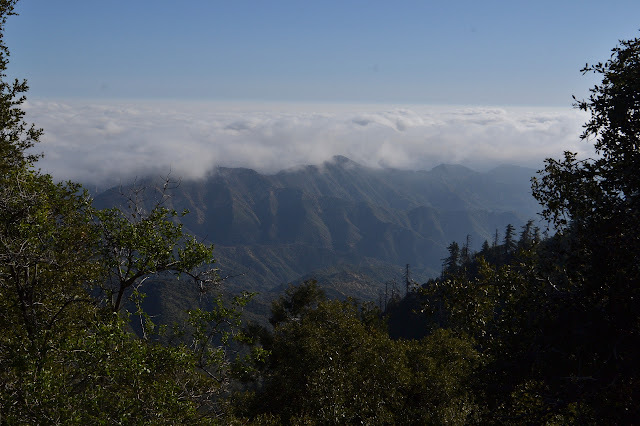 Over the ridge to Madulce Peak, there seems to be a similar blanket of clouds as was there yesterday. I keep on going up and over the top and down the road on the other side. 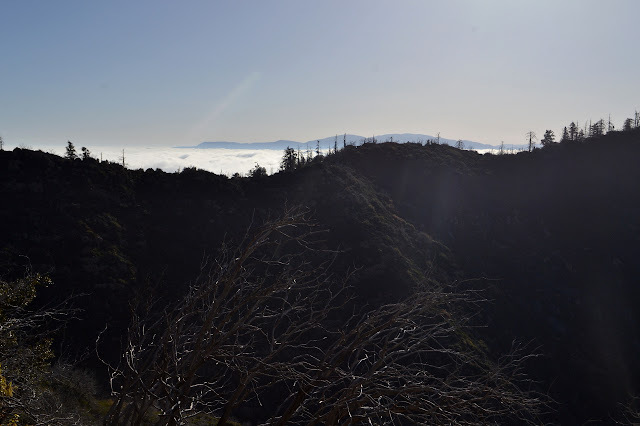 I probably would have chosen to take the trail down the upper Sisquoc again and back up Judell Trail to head out, except for that goal of going up Samon Peak. The usual route heads up from the road and it might be quite difficult to do an unusual route. Actually, I am a little worried about the usual route too. One fellow said that although he usually gets himself up these Hundred Peaks Section listed peaks on his own, he has tried and failed to find the way up this one twice. The second time, he even had a GPS track. I took the liberty of grabbing a track myself in my preparation a month ago and still have it now. We shall see if it serves me better than him. Maybe he tried to follow it too closely? It is not something to worry about now. Do and find out. And enjoy the misty paradise that is the valley on the way. Over the top, the mists are not quite so valley filling as they looked, at least not very locally. The bear did not come back in the night, or at least not while I was awake enough to notice. When I woke, it was clear, but first light comes with an inrushing of clouds. It is not a weather pattern I am familiar with. Clouds build at night in my experience. My bag is as dry as it will ever be once the clouds become fog, and I stuff it away quickly. Although unexpected, the clouds do not worry me. I will climb above them or they will burn off by the time I am on the first peak and ready for the view. 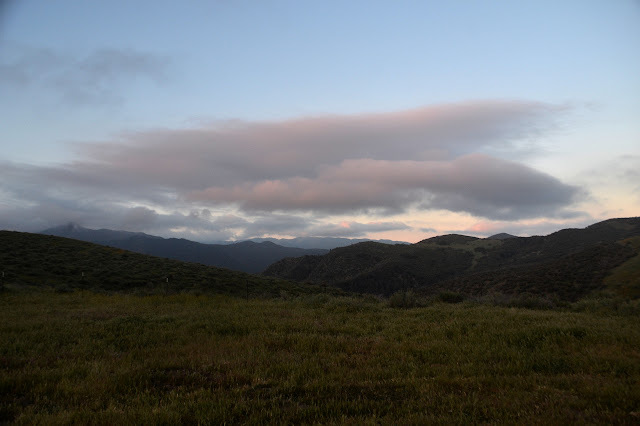 An absolutely clear crack of dawn quickly fills in with cloud at the Madulce guard station site. The trail is less obvious above the camp, but still easy to follow. 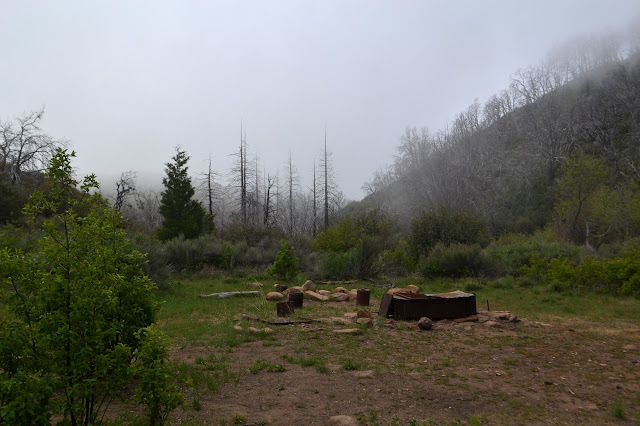 After the first creek crossing is another camp site with a pair of stoves and a shovel. 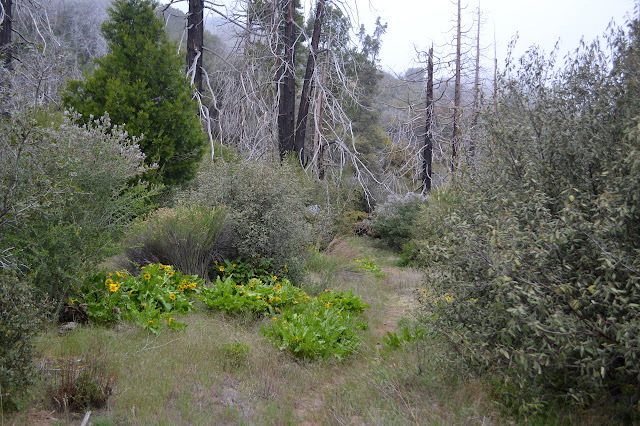 Another patch of mules ear on the way through the Zaca Fire burned trees and little meadows in this high valley. 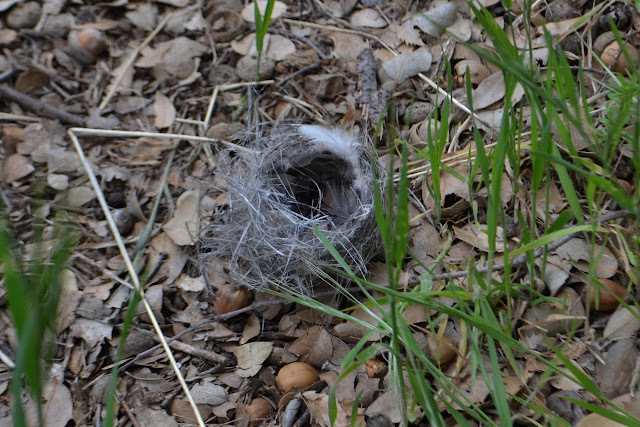 A tiny bird nest dropped from somewhere to be on the trail. The trail starts to climb a bit more after one crossing and I suspect this might be the start of the real climb up to the ridge line of Madulce Peak and perhaps I should get water here. A few more steps and a log along the side of the trail with all its limbs chopped off. I remember this log from another bout of trail work when we came down from above. This is definitely the last chance to get water. I will probably need about ten pounds more of the stuff before I pass any source along my route. My plan is to drop my gear at Alamar Saddle and take the half mile trail down 400 feet to get it from Upper Bear where I know there is a nice creek flowing. Maybe it would be easier to just haul it up with everything else now? It is not that many miles a climb. I dither a moment, then decide the water looked a little mucky by the crossing whereas the stuff at Upper Bear is really pretty, so stick with the plan and start to climb. 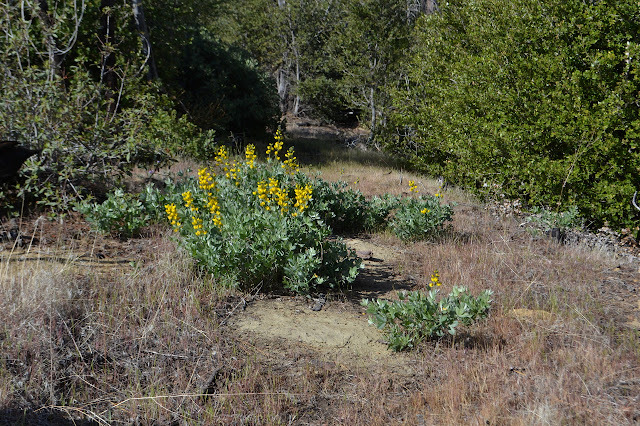 A patch of yellow sweet peas seem to be thing to take over this bit of trail. Those three peaks of what the Hundred Peaks Section call the "big four" still need climbing. Well, maybe not need, but I do want to go up them and one of them is the county high point. I have visited all these surrounding county high points, it is time I got my own. Besides, I am feeling a little bit of pressure to go ahead and do it. I have little idea what my near future holds, but I am fairly certain that it will involve leaving Santa Barbara. 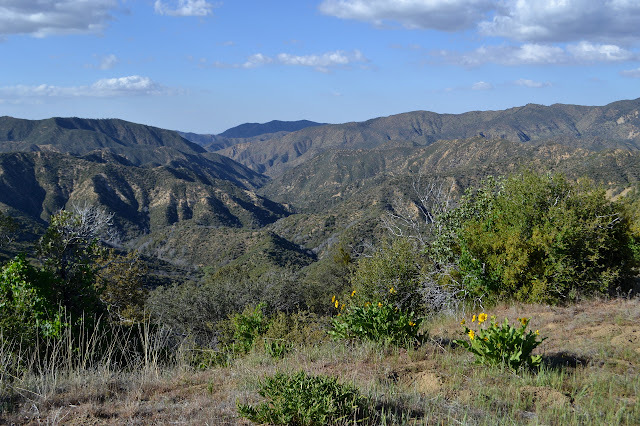 This time, I headed out to the more traditional starting point for them in Santa Barbara Canyon. I am planning four days with easy ones at the start and end. That way, if I cannot get my car along the road, the last couple miles of which are technically only 4WD maintained and the rest of the dirt miles cannot be expected to be much better. Not that I left early enough to do the road miles if I had to. I actually only packed up in the morning, so it is a good thing the road was fine all the way to the parking at Willow Flat. 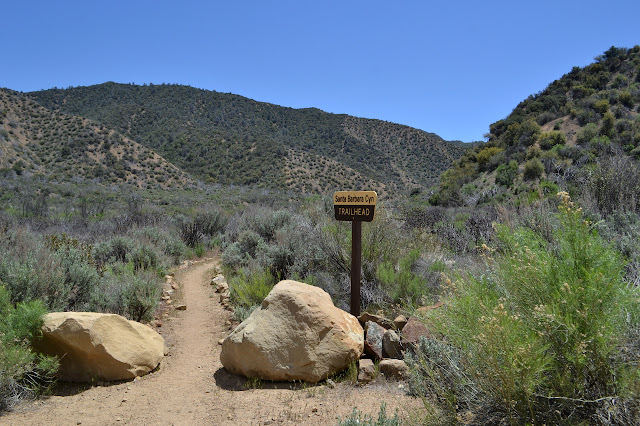 The well marked trail at Santa Barbara Canyon Trailhead. This is a few miles down rough road behind a seasonally locked gate. The weather looks lovely, at least until the weekend, for Santa Ynez. 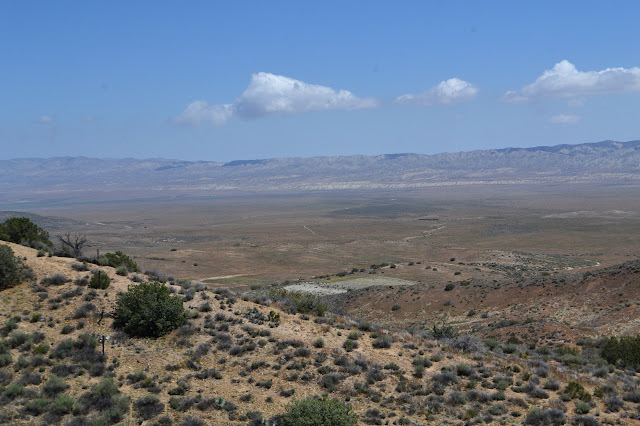 It even looks warm, but bearable, for New Cuyama. I did go ahead and check what the mountain forecast said about Big Pine Mountain and took a look at a fairly relevant spot on the map before heading out this time. They both predicted lows around 44°F and highs more like 56°F on generally sunny and dry days. A temperature variation of about 10 F° is absolutely bonkers. It might be able to vary that little with a really thick blanket of cloud consistently covering over, but not when clear. I have noticed some hot and humid places seem to be able to do this sort of thing, too, but that takes a whole lot of water in the air and it does not hold enough at these temperatures. Meanwhile, I have looked at predictions and seen low 44°F then woken up with a bit of ice on me enough times that it is starting to be a bit of a trigger. It is nonsensical to see 44°F and think "ice is immanent", but slightly less so than a tiny temperature variation and clear skies. It will change that much just in the hour the sun goes down. I am ready for it to freeze at night, but then warm up a bit more in the day. No tent again. There is a new moon tonight and it would just block out the stars. 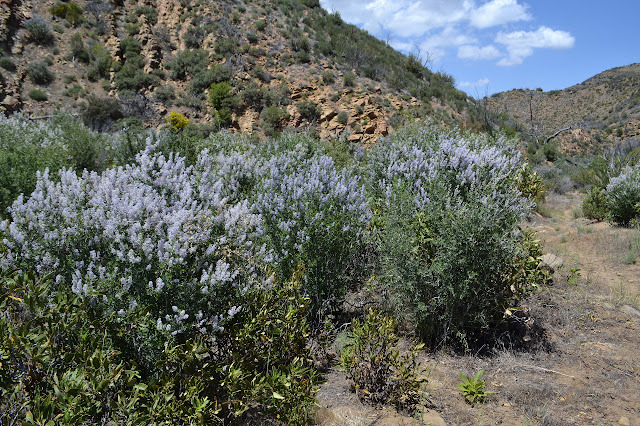 Plenty of ceanothus now getting into bloom along the side of the trail. 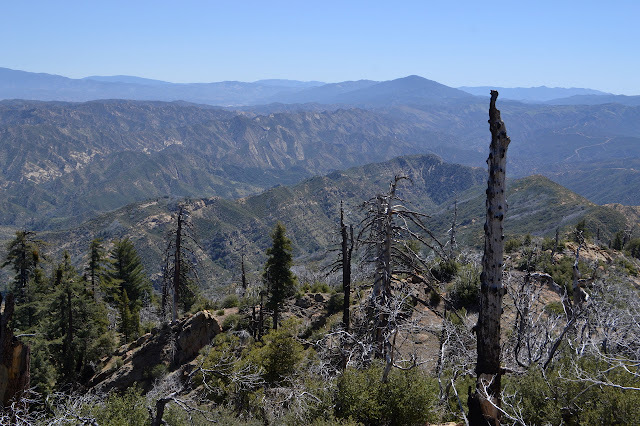 The canyon is wide open and the trail is too for the first three miles except for a few downed trees, mostly long dead cottonwoods, and willows at the creek crossings. It is easy and flat and familiar. I helped cut the brush back off the trail some years back and a few other groups have been through since then. 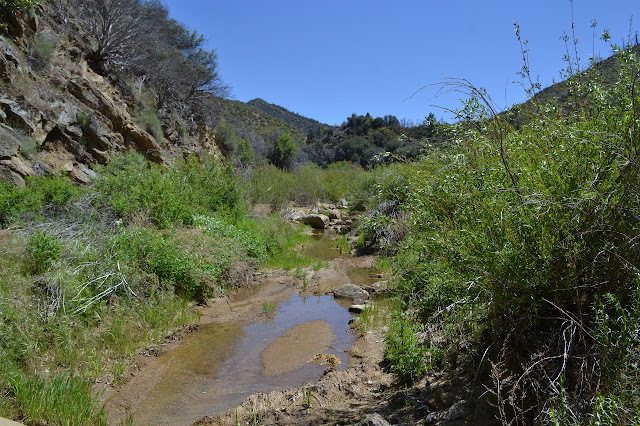 The creek is dry at first, but then there are a few stagnant puddles and then flow. Realizing it was already past lunch when I started and I have only had breakfast, finding the flow inspires me to sit and snack and listen for a bit. Spotty flow through a puddle before the creek really gets to flowing. 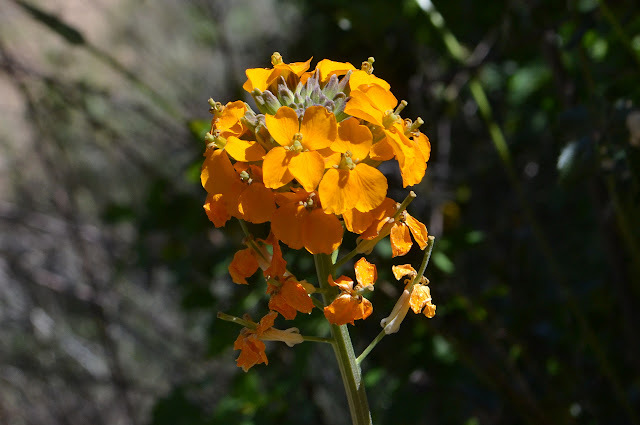 One of a few wallflowers that are out now. 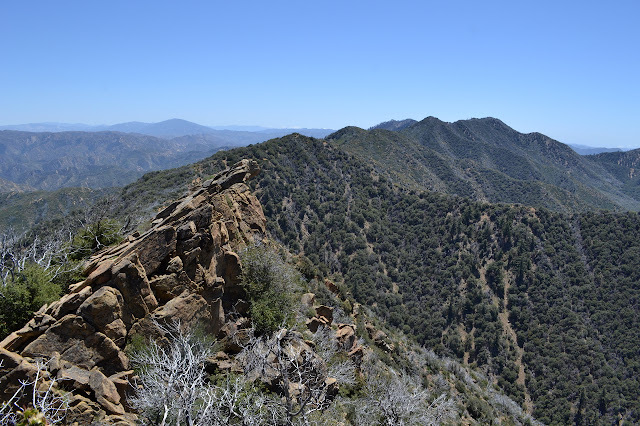 I have been thinking I might return to Caliente Mountain for a climb of it rather than a walk over from the side of it. I am not too keen on the traditional really hot day for it, though. 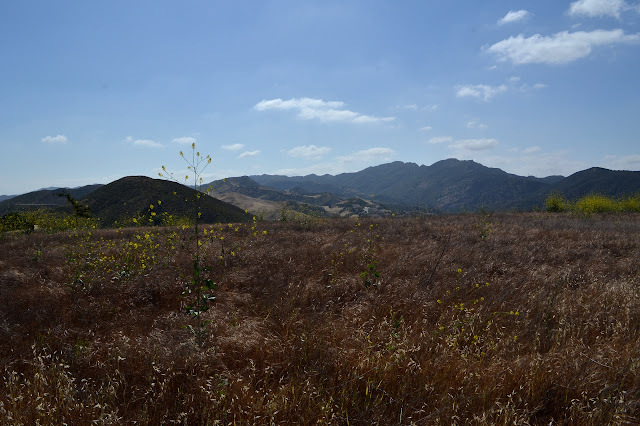 I signed up for another Hundred Peaks Section hike, this time lead by the Doggetts and Jin Oak. At least one Simpson did it the week before, but I did not get signed up to that one. The weather promises to be stunning: a little cloudy and cool although with just a touch of a possibility of a chance of rain. Well, maybe a little more than that. It might rain. The early morning drive started into a stunning sunrise full of clouds and the spaces needed to let the light hit those clouds. We parked a little further from the mountain than expected at a new locked gate that sprang up a few years back, not quite using the parking area designated by some pipes on the opposite side of the dirt road. The gate across the fading road at our start. 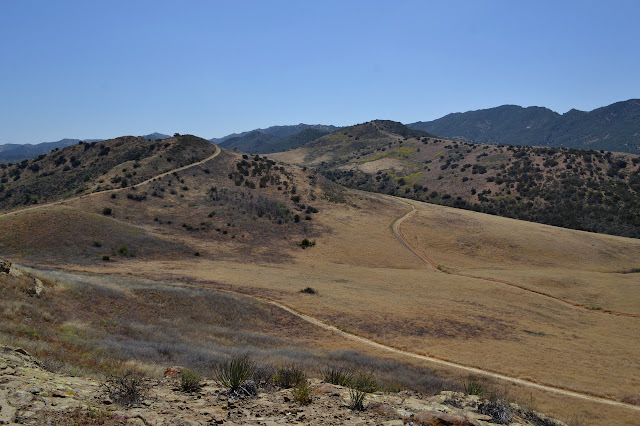 Caliente Mountain is the high point toward the left. 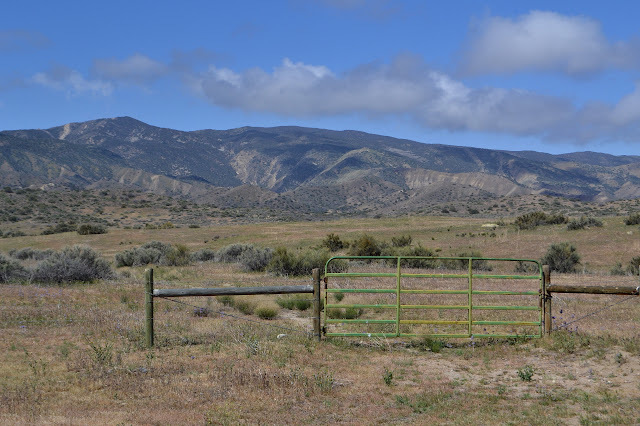 With our boots on and our gear set for hiking and the sign in complete, we walk around the gate and fencing blocking our vehicular progress and set out across the grasses on a shortcut of the fading road that loops a bit to the north. The drying grasses have just enough moisture left in them to leave our socks alone with their sharp seeds. There are only a few flowers mixed in, generally in clumps. A bi-colored composite and a very puffy chia variety among the not-quite-dry grass. A gully gives us a bit of trouble in the crossing. Higher up, it is a step across as long as one can find stable footing on the sides. Further down, it requires a bit of climbing. Maybe down by the road it is fairly smooth. We get back on the road as we come to what was once the end of a drive for this hike. The gate here looks more official, having signs like "administrative use only" and a handy hiker gate to the side. Now we follow the faint road upward until if stops, having gotten... where? There is a decaying piece of machined wood, wider than a typical fence post, to the side and otherwise nothing. Our stop is high above, so we climb the hill ahead past another old fence to the ridge line. Looking across the plain. The old fence line below is a bit burned.